"KWD" redirects here. For other uses, see KWD (disambiguation). 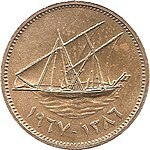 The dinar was introduced in 1968 to replace the Gulf rupee, equal to the Indian rupee. It was initially equivalent to one pound sterling. As the rupee was fixed at 1 shilling 6 pence, that resulted in a conversion rate of ​13 1⁄3 rupees to the dinar. 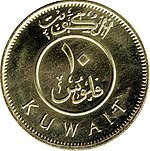 When Iraq invaded Kuwait in 1990, the Iraqi dinar replaced the Kuwaiti dinar as the currency and large quantities of banknotes were stolen by the invading forces. After liberation, the Kuwaiti dinar was restored as the country's currency and a new banknote series was introduced, allowing the previous notes, including those stolen, to be demonetized. The coins in the following table were introduced in 1961. The design of all coins is similar and has not changed since they were first minted. 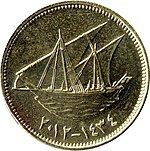 On the obverse is a boom ship, with year of minting in both Islamic and Common Era in Arabic. 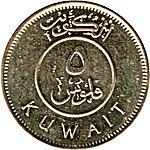 The reverse contains the value in Arabic within a central circle with إمَارَة الكُوَيت (The State of Kuwait in Arabic) above and KUWAIT in English below. 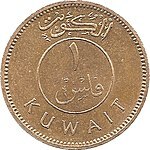 Unlike many other Middle Eastern currencies, Kuwait has a coin worth 0.2 of its main currency unit rather than 0.25. The 1 fils coin was last minted in 1988. Six series of the Kuwaiti dinar banknote have been printed. 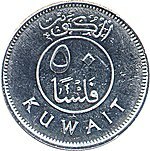 The first series was issued following the pronouncement of the Kuwaiti Currency Law in 1960, which established the Kuwaiti Currency Board. 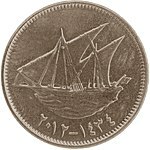 This series was in circulation from 1 April 1961 to 1 February 1982 and consisted of denominations of ​1⁄4, ​1⁄2, 1, 5 and 10 dinars. After the creation of the Central Bank of Kuwait in 1969 as a replacement to the Kuwaiti Currency Board, new ​1⁄4, ​1⁄2 and 10 dinar notes were issued from 17 November 1970, followed by the new 1 and 5 dinar notes of the second series on 20 April 1971. This second series was withdrawn on 1 February 1982. After the liberation, a fourth series was issued on 24 March 1991 with the aims of replacing the previous withdrawn series as quickly as possible and guaranteeing the country's swift economic recovery. This fourth series was legal tender until 16 February 1995. Denominations were ​1⁄4, ​1⁄2, 1, 5, 10 and 20 dinars. The fifth series of Kuwaiti banknotes were in use from 3 April 1994 and included high-tech security measures which have now become standard for banknotes. Denominations were as in the fourth series. Central Bank of Kuwait brought the sixth series of Kuwaiti banknotes into circulation on 29 June 2014.Some of the bills are coarse so that the blind can identify them by touch. In both 1993 and 2001, the Central Bank of Kuwait issued commemorative 1-dinar polymer banknotes to celebrate its Liberation from Iraq. The first commemorative note, dated 26 February 1993, was issued to celebrate the second anniversary of its Liberation. The front features the map of the State of Kuwait, the emblem of Kuwait and on the left and right side of the note is the list of nations that assisted in its Liberation, in both English and Arabic. The second commemorative note, dated 26 February 2001, was issued to celebrate the tenth anniversary of its Liberation. One feature from the note is an optically variable device (OVD) patch that shows a fingerprint, a reference to the victims of the invasion and occupation of Kuwait. Even though they were denominated as 1 dinar, both of the commemorative notes state that they were not legal tender. From 16 June 2007, the Kuwaiti dinar was re-pegged to a basket of currencies, and was worth about $3.28 as of December 2016. ^ "Exchange Rate Policy". www.cbk.gov.kw. Retrieved 14 June 2016. ^ Linzmayer, Owen (2012). "Kuwait". The Banknote Book. San Francisco, CA: www.BanknoteNews.com. ^ a b Ibn, Ifat (4 July 2011). "Friday Market Kuwait - Gulf Local Classifieds". Friday Market. Retrieved 20 March 2016. ^ "New Kuwaiti banknotes due to appear on Sunday designed on bases of beauty, safety". KUNA. KUNA. 28 June 2014. Retrieved 6 July 2014. ^ "Arab Times -Leading English Daily in Kuwait". ^ The Sixth Issue banknote series Central Bank of Kuwait (www.cbk.gov.kw). Retrieved on 2014-05-22. ^ Kuwait 1 dinar commemorative banknote (1993) Banknote Museum (banknote.ws). Retrieved on 11 February 2013. ^ Kuwait 1 dinar commemorative banknote (2001) Banknote Museum (banknote.ws). Retrieved on 11 February 2013. ^ "Kuwait pegs dinar to basket of currencies". Forbes. 20 May 2007. Retrieved 6 June 2007. This article draws heavily on the corresponding article in the German Wikipedia, retrieved 2 March 2005.